What is the Faust Project? That is called "Faust Adventurers’ Guild"
Centered on the themes of adventure, challenge and contribution, theproject aims at developing a special membership-based organization thatchallenges the rich assets of the heart and mind. Members of the club will seek to tirelessly pursue adventure andchallenge, regardless of age, with a view to enjoying life and givingback. 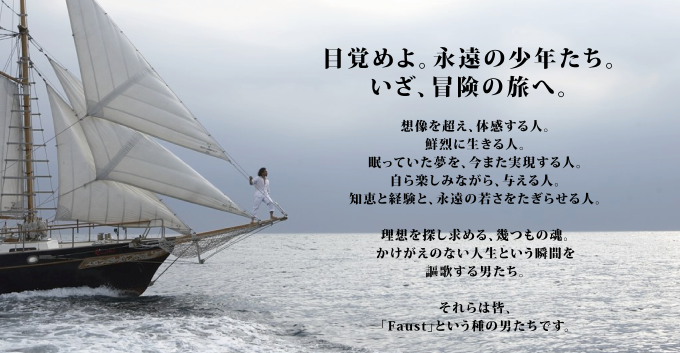 In the project, we call Faust, members agree with the Faustconcept and way of living, and its statutes. Secretariat of FaustAdventurers' Guild will plan and offer the opportunity for invaluableexperiences such as challenging and adventurous journeys that couldchange one’s life philosophy. Faust will also disseminate theseactivities in media including websites, magazines and TV so thatmembers can foster the “Faust” lifestyle, a profound and affluent viewof life within society. Members are active in the upper echelons of society. They consistprimarily of management executives, cultural figures, specialists andadventurers and so on. Entry to the group requires a referral or aninvitation. Financial assets and the like are not examined. Preferenceis given to sophisticated people with keen senses who have the abilityto influence society. Primarily through those our activitiy and event will contributes toimproving members’ lifestyle. The main objective of activities is topublicize the information on Faust lifestyle to selected media and todisseminate a positive view of life via the secretariat. Activities to date include the Faust Racing Team (participation in theSuper endurance car races). More activities seeking adventure,challenge and contribution are coming in the future. Secretariat of Faust Adventurers' Guild?